Kitchen rooms are the places where we dwell in and cook food. It is a part of the house where mouth watering and flavorsome food is prepared. 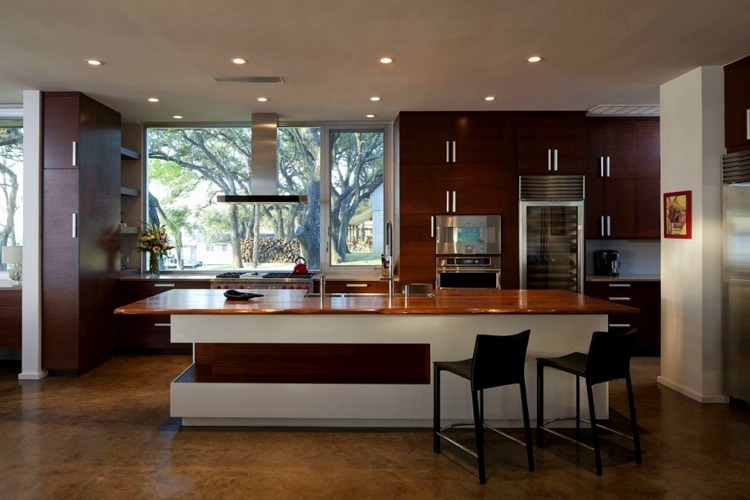 Here are few images of contemporary style kitchen which gives a classy and modern look. Contemporary style looks beautiful with its simplicity. Kitchen includes cabinets, counter, chimney, faucet, bar tables, kitchen ware, island and some kitchens may even have a dining. The kitchen is designed based upon your taste, it can be either a open kitchen or closed kitchen and it can be of different shapes. It is designed by the amount of space allotted to the kitchen. 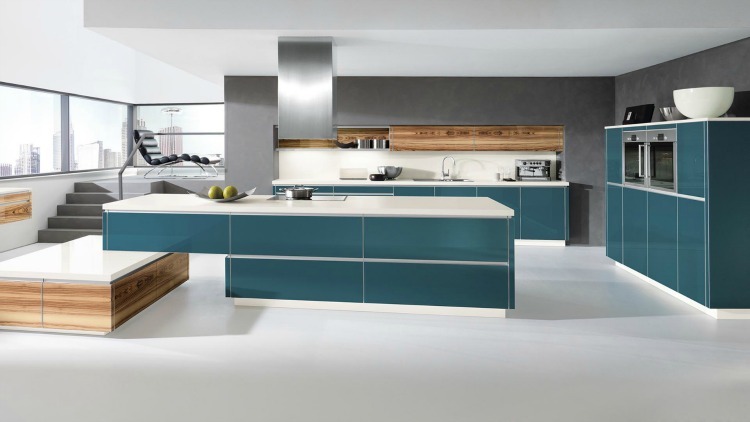 In the view of the image you can see a contemporary style of kitchen which is decorated with monochromatic color. The false ceiling is dry wall ceiling with pendant lights attached to the roof and the flooring is made of warped wood. The room has metal panelling, wall cladding which gives a stunning look to the entire room. The kitchen room has a faucet, ceramic bowls and tins and has counter. The room has picture windows to view outdoor garden which is alluring. There are plenty of cabinets to store groceries, kitchen ware and there is an inbuilt micro wave oven. This image views you a contemporary style of kitchen room. The false ceiling is dry wall ceiling with the circular crystal pendant light and a metal chimney is attached to the roof and it makes the room oil, smoke free. The room is decorated with colorful black in contrast with red cabinets. The room has a counter with stool which can be used for having casual drinks. There is an inbuilt micro wave oven and has counter with stove, faucet and utensils. The flooring is made of glossy ceramic tiles and the room has decorated with white sheer curtains. The interior has dry wall ceiling and the flooring is made of glossy ceramic white tiles. There is a chimney attached to the roof which makes the room clean that is oil free. The room has cabinets of white, purple which has a jazzy look and there are lofts attached to the roof. In this kitchen the island is attached to the the counter which can be used for preparing food or serving. The interior is decorated with wall paper of light brown color and has black blinds. The balcony is adjacent to the kitchen and this an L shaped kitchen. The false ceiling is dry wall ceiling with plain light fixtures and the flooring is made of textured vinyl flooring. The kitchen is I shaped kitchen with a large rectangular island with closets to store accessories and has chairs which can be used for serving or consuming food. The room has casement windows where we can view the outdoor garden. There are many cabinets where we can store groceries and kitchenware.There is inbuilt micro wave oven in the cabinet and electrical appliances on the counter. The room has photo frames mounted on the wall. The flooring is made of warped brown wood which is sprucing in the room. The room has L shaped kitchen and has counter with bar tools and has stove. The kitchen has panelling and has wooden closets to store jars, ceramic bowls and faucets. The false ceiling is dry wall ceiling with recessed lights and has a chimney attached to the roof. The interior is covered with a wall paper and has photo frame mounted on the wall. There is an inbuilt micro wave oven and has an refrigerator. 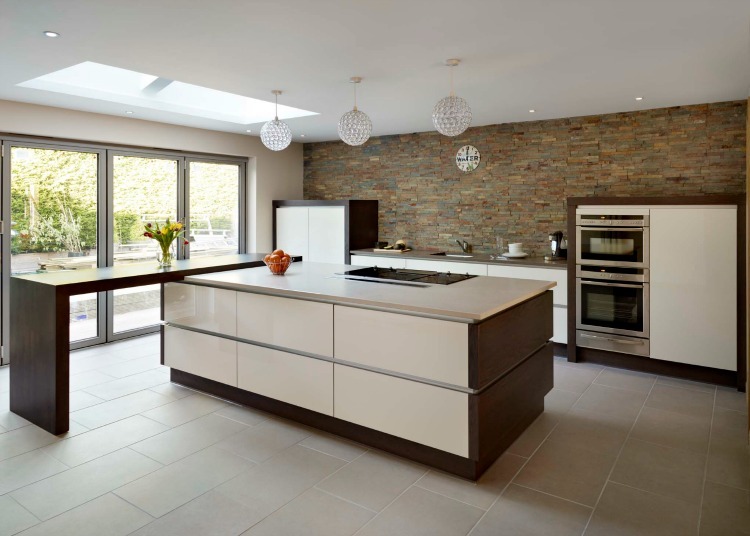 In the view of the image you can see a contemporary style kitchen room which looks elegant. The false ceiling is a dry wall ceiling with a dura vent chimney attached to the roof. The flooring is made of white plain vinyl flooring which looks glossy and the interior of the wall is decorated with grey wall paper. The room has blue cabinets and has inbuilt micro wave oven. The cabinets can be used to store groceries and has wooden cladding contains utensils. The room has casement windows from where we can view outdoor and there is a stair case for seating with curved legs. This kitchen is an open kitchen which is adjacent to the living room. This is L shaped kitchen with an island and the wall is decorated with red brick cladding. The room has a metal chimney attached to the roof which makes the interior smoke and oil free. The counter has cabinets, faucet, stainless steel utensils, and dish towel. The room has a fire pit and has other chimney which acts as an outlet to make smoke free. There is yam orange counter with chairs which can be used for consuming food, preparing food or for having casual drinks. The false ceiling in the kitchen room is drop out ceiling with unseen lights, light fixtures and a rectangular pendant chandelier attached to the roof. The flooring is made of laminated hard wood and the kitchen is an open kitchen. The interior is decorated with snowy white color and has wall cladding with closets to store groceries. It has an indwell micro wave oven and the room has cabinets to store accessories. The kitchen is adjacent to the living room where you can see a television and couches for seating. The room is baronial and has counter with the wooden tables for consuming food. In the view of the image you can see contemporary style inky kitchen room. The false ceiling is dry wall ceiling with simple light fixtures and the flooring is made of laminated walnut wood. The room has dark grey counter which has a stove, faucet, sink and a wooden bench with the chairs which can be used for consuming food. There is a open kitchen which is adjacent to the living room and has closets with decorative items. There are cabinets for storing groceries and has inbuilt micro wave oven. In the view of the image you can see a simple contemporary style kitchen room and the false ceiling is a dry wall ceiling with simple light fixtures. There are crystal pendant lights which are attached to the room which lighten up the room and has ceramic tiles laid as flooring. The walls of the interior is decorated with brick cladding and has cabinets with the inbuilt micro wave oven. The kitchen is I shaped with a counter which has stove and a wooden table for preparing food. The room is decorated with casement windows and can view beautiful exterior.